My inbox is overflowing with email from places from which I'll probably never make a purchase again. Some of the email I don't ever look at; it's deleted immediately. I know you know what I mean. But I'm getting better at unsubscribing. One day it will be more manageable. But there are emails that fill my inbox that I absolutely love: personal notes, the occasional email from Habu, and the fairly regular email from Purl Soho. And though Purl Soho happens to be a very convenient three minute walk from where I live and work, my inspiration from Purl Soho very often arrives by email. That's where I first saw Molly's Simple Felted Mittens. I love the clever construction. And since I'm temporarily restricted to sewing my own sweater knit fabrics (my self-imposed restriction), I decided to give them a go using a plain double knit, a fancy double knit, and ribbing. 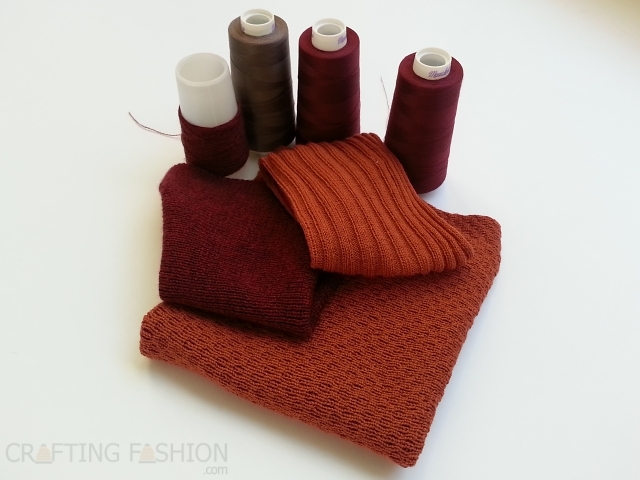 The rust-colored double knit has a subtle texture, which is more prominent depending on lighting and the viewing angle, like the grain of a woven fabric. 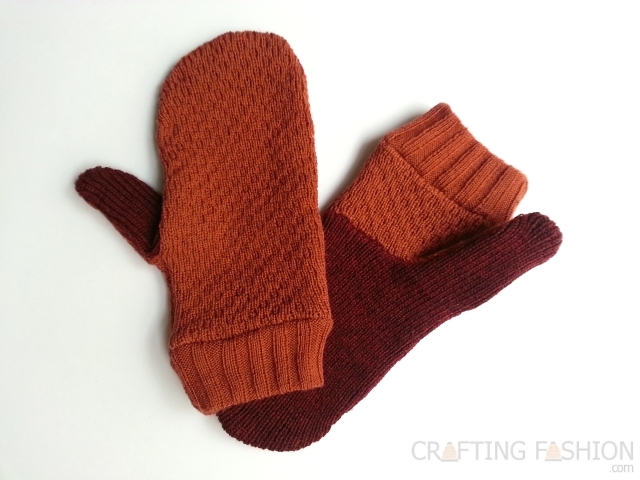 I ended up using the paper pattern download from Molly's original Felt Mittens with Knitted Cuffs. Though I used a serger for most of the construction, for the tricky thumb and seam on the palm it was easier to zigzag each piece, then sew with a regular sewing machine. In this way I was able to open the seam allowance for the rest of the stitching. (See instructions on Purlbee.) 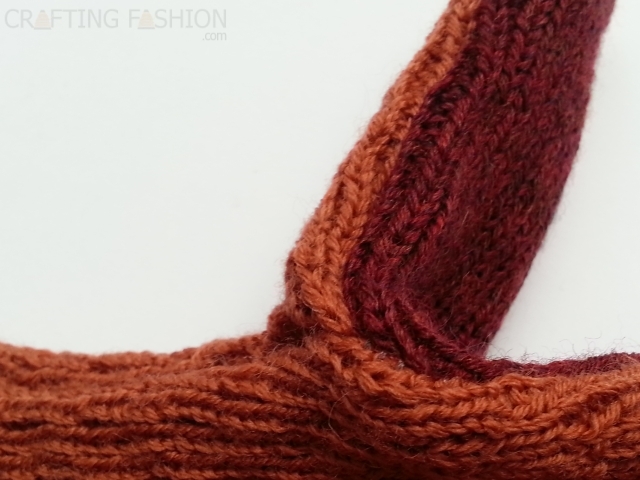 And I did not clip the curved seam allowance on tip of the thumb, as it was unnecessary with the knit fabric. 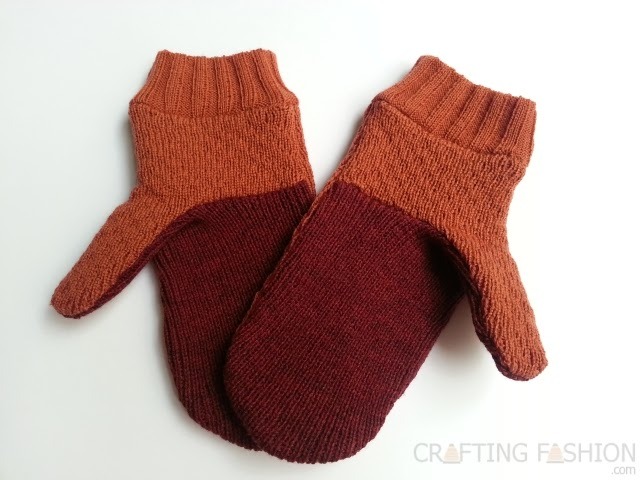 The ribbing and texture make the mittens not quite as elegant as Molly's Simple Felted ones. I may sew a pair one day without ribbing and just a simple double knit. The 100% Merino wool, however, makes them soft, cozy, and warm. With each project that I complete, I feel more prepared to get back to the original inspiration for this blog, the Pattern Magic: Stretch Fabrics book. A recent comment on this site led me to Lisa's Small Things blog, where she's doing a Project Pattern Magic. I think I'm going to sew along when she gets to the knits. Perhaps you'd like to join in? With the freezing weather we've been having in Quebec, I need really warmer mittens. 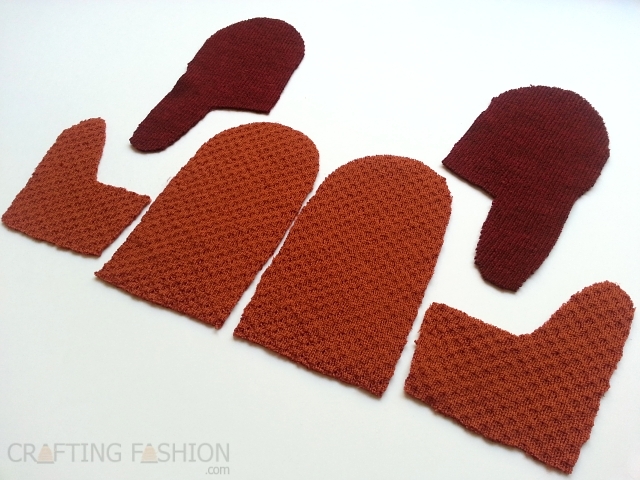 You've inspired me to try to machine knit some wool in double jacquard on my Passap and to felt it! That should keep my fingers toasty! I wonder, should I felt the fabric or the sewn mittens? Wouldn't it be warmer if the seams are also felted? So happy I found your blog! I recently bought a brother kh260/270 and am looking for interesting projects that can help me learn to use it, and this seems like just the place - thank you for posting all this great information. Can't wait til I'm confident enough to cut and sew, too. Those are really cute mittens! I like your color choices too. Thanks. And they're fun, if you're looking for a quick project.